J. R. R. Tolkien’s Middle-Earth has been home to some of the most cherished fantasy novels in history, and it’s a setting that continues to draw in fans old and new. You can even enter the world of Hobbits, Dwarves and Elves on your smartphone or tablet and immerse yourself in the lore, language and caveats that make Tolkien’s world so special. 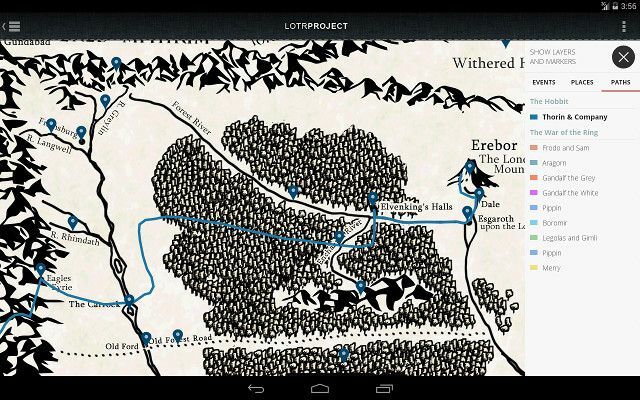 Here are six mobile apps that every Tolkien fanatic must check out. The world of Middle-Earth is defined by its depth, but that same depth can become a problem. Not everyone can remember lists of family relations or recall the geography of the world’s more obscure regions. With LOTRProject, however, you don’t have to. Everything can be accessed from your Android smartphone. You can think of this app as a mobile Middle-Earth encyclopedia. Unlike the many wikis devoted to the subject, this app is designed purely for mobile browsing and is curated with care. 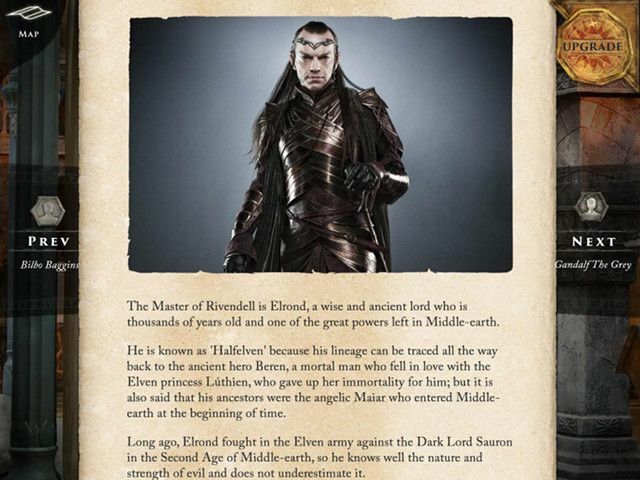 You can find information about the inhabitants of Middle-Earth, including full family trees, maps of the landscape, and a timeline of events in the fictional world’s history. There are even character summaries for all of the central characters in The Hobbit, The Lord of the Rings and some expanded universe content. Interestingly, a connection to the Middle-Earth page on Reddit is built into the app, which means you can ask questions from within LOTRProject if you can’t find the information you’re looking for. While the app is only available on Android, PC and tablet users aren’t left out, as the app is really a mobile rendering of the LOTRProject website. The app is preferable for Android smartphones but also costs $1.85, while the website is free and seems to contain identical information. This app is similar to LOTRProject but has been around longer, making it the elder of the two Middle-Earth encyclopedias. While it lacks the super-slick look of its rival, it makes up for that with attention to detail. 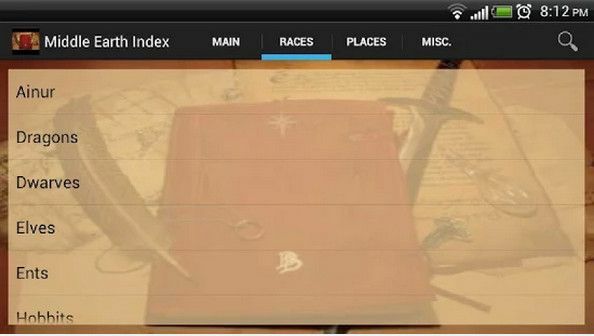 Developer Tim Dyck built this app because he was having trouble keeping all the names, locations and bits of minor trivia found in The Silmarillion and The Unfinished Tales straight. 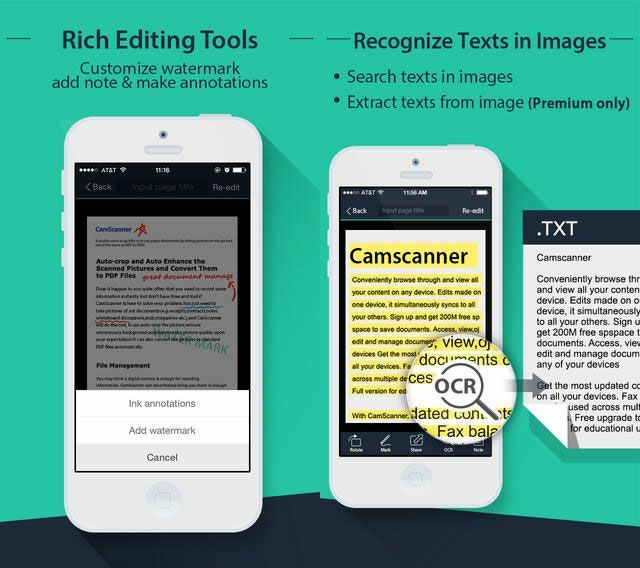 As a result this app has a catalog of over 5,000 terms, some of which are extremely obscure. In its own way, then, this app is more complete than the LOTRProject in its current form. Middle Earth Index lacks family trees and beautiful maps with locations pinned to them, but it has information that you’ll only find in the most detailed fan wikis. You can learn about the Maiar, explore Saruman’s final fate, or discover the differences between different types of wargs. Grab Middle Earth Index for free on Android. 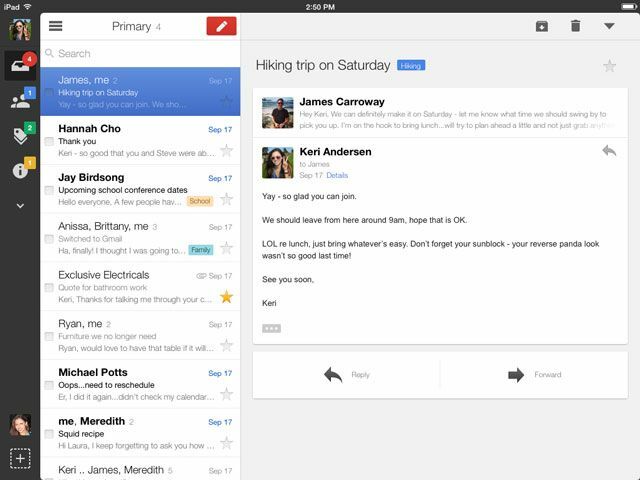 While it works on any Android 3.0 or better device, it’s best on smartphones, as the text doesn’t scale well on larger devices. This is the official “companion” for the book and movies, published by Harper-Collins. This doesn’t mean much in theory, but since it’s put together by a large company with a big budget, the app has the luxury of attractive high-resolution photos and an attractive 3D map of Middle-Earth (well, most of it, at least). Even LOTRProject is blown away by the presentation of this app. The quality spills over to the character biographies and trivia the app presents, all of which is accompanied by official photos from the Hobbit scaled for super-HD tablets. Looks aside, though, the app is pretty short on content. The free version contains an attractive map but only includes biographies of a few central figures. Unlocking the full version means forking-out $4.99, but this only grants access to the full compliment of 75 entries. While that’s probably enough for a casual enthusiast, this app isn’t going to tell a Tolkien diehard anything he or she doesn’t already know, and a lot of the same information is available for free through various wikis and the other apps listed here. If you are a newbie to Middle-Earth, though, this isn’t a bad place to start. You can grab the app on any iOS device running iOS 5.1 or newer, but I recommend viewing it on an iPad with Retina display. Elves are among the most enchanting of Tolkien’s fantastic creatures. Often depicted as super-human in their abilities, in possession of a beautiful and magical language, and blessed by long life, it’s no wonder that many fans of fantasy (be it Tolkien or otherwise) have become obsessed with these pointy-eared protagonists. If you’re among their fans you may want to learn their language, and that’s exactly what ElvenSpeak enables – to a point. 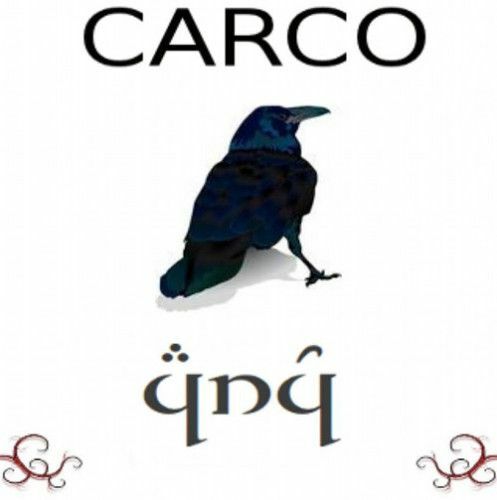 This app includes a searchable Elven to English dictionary, a date converter, and twenty lessons that allegedly help you learn to speak Elven. Don’t take this too seriously. ElvenSpeak is not WeSpeke for a fantasy language; it’s just an amateur’s effort to help fellow fans dig deeper into the lore and nerd out. The app is only for iPhones and iPads running iOS 6 or newer, but if you have a compatible device you can download the standard version for free. A newer version, ElvenSpeakProHD, is available for $1.99, but it’s a rip-off because the interface graphics are just stretched instead of up-scaled. Stick with the freebie! Launched in parallel with the movie, this game is the one of two mobile titles currently available for Android and iOS devices. Since it is based off the movie, rather than Middle-Earth in general, the game takes visual inspiration from its big-screen progenitor. The 2D characters look a bit like the actors from the films and graphics as a whole mimic the vibrant yet earthy look favored by The Lord of the Rings and The Hobbit films. Actually playing the game is a bit strange. You’d expect an adventure, but what you get is a strategy title with a focus on building your lands and an army. This doesn’t make much sense in the context of the films or books and it’s obvious from the start that the developer, Kabam, was told to make a cash cow free-to-play game on as tight a budget as possible. Now, don’t get me wrong; this game isn’t horrible to play. The game’s pace is fairly quick for a strategy title and the difficulty quickly ramps up – perhaps too quickly, in fact, which is where the micro-transactions come in to play. There are few bugs and the graphics are sharp enough for a 2D multi-platform mobile game. In short, it’s serviceable, and since it’s free there’s you’re not out anything but time if you don’t like it. If it’s a Middle-Earth adventure you want (and really, isn’t that what it’s all about?) then you absolutely must check out LEGO Lord of the Rings. Based on the familiar formula that has worked for numerous franchises before it, the LEGO game puts you in command of numerous characters from the books and films and gives you the opportunity to relive famous adventures in plastic. Like other games in this series, this title is a linear adventure with basic combat, plenty of puzzles and a lot of exploration. Beating the story missions is simple and probably won’t take more than ten hours, but as you progress you’ll find various secrets and can accumulate “studs” (the game’s currency) to unlock new characters. These characters not only look different but also have their own unique powers, which may provide access to areas that previously weren’t available. This is an all-ages game that’s fortunately not free-to-play, which involves immersing yourself in a LEGO recreation of Middle-Earth that scoops lines of dialogue from the films and visits all the major locations. 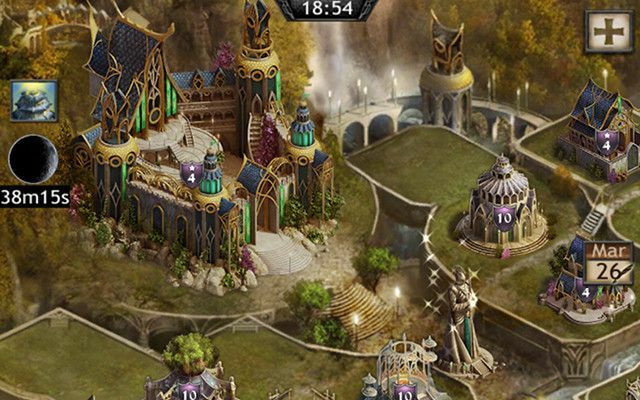 Think of it as a Middle-Earth theme park for your tablet. 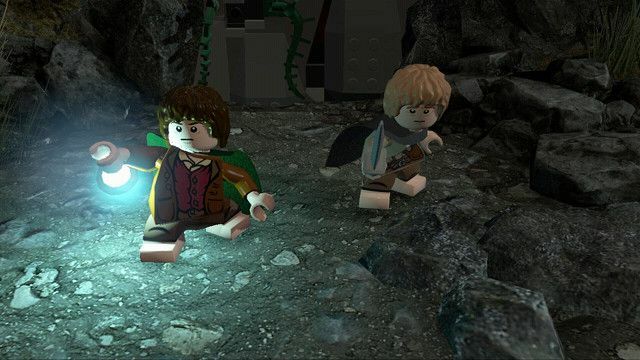 You can grab LEGO Lord of the Rings on any iOS device that runs iOS 6 or better for $4.99. The game is also available all major game consoles except PlayStation 4, Xbox One and Wii U. There are a surprising number of apps about Middle-Earth on Google Play and Apple’s App Store, but most are lame trivia apps, and some are nothing more than a 3D rendering of the One Ring you can spin by swiping your finger across the screen. Most of these apps are rip-offs and don’t do much even when they work correctly, created in a rush to cash-in on movie and game releases. Is your tablet loaded with Lord of the Rings and The Hobbit apps? Share your favourites below. Apple Keynote In 9 Minutes, Introduction All New Macbook Air And Ipad Pro.